This long lived perennial produces beautiful, long lasting, and very large 3 - 4 inch purple-red flowers with bronze domed shaped centers on long stems. Wildflowers require little care. 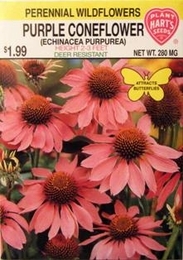 Water Purple Coneflower only when necessary. For additional plants, divide clumps after 2-3 years of flowering. Thinning - when plants are 2-3 inches tall thin to 18-24 inches apart.